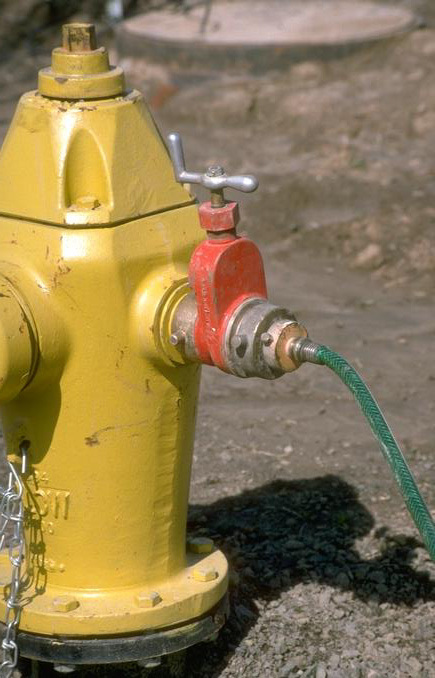 Mountain Regional has thousands of fire hydrants which are inspected and maintained for your safety and for the protection of your property. If you ever see (or hear) a hydrant which may be leaking or is used for an unauthorized purpose (as in the picture to the left), please let us know immediately. Hydrants are often used for construction or dust control water. If so, they will have a meter on them - provided by us. We will also inspect the meter and the hydrant when the construction water ceases to be needed. Please take a little time to adopt a fire hydrant near your home and help to keep obstructions and vehicles away form it. Clear any snow away from it in the winter months, and please let us know if the hydrant needs any maintenance or a hydrant marker attached to it. Some fire hydrants on very large lots - where an additional hydrant was necessary, to be located within the property or next to the home, are private hydrants, and are to be maintained by the home or property owner. If you have a question about this - please contact us.